One of the most fun things you can do in a kitchen with your kids is to make a pizza. Our family comes from a long history of cooks so the tradition runs deep. There is not a wrong way to make a pizza and it is one of the few things you can make where you decide on all the goodies to add like you like it. Our kids enjoy making their own pizzas as individual as they are. So, when a Papa’s Pizza is not available to you, we want to share our home pizza making experiences with you and your family. For this excellent at home pizza your prep time is about 20 minutes and the cook time takes about 25 minutes. First we want to start off with the dough which is a lot of fun and there is some science involved here. We will then make the sauce and get ready all of your favorite pizza ingredients. Now you can cheat a little and buy pre-made pizza crusts… but they are not as fun and as good as fresh dough. In the bowl of a standing mixer, fitted with a dough attachment, mix together the flour, salt, sugar and olive oil. Stir the yeast in the water to make sure it’s all dissolved and add it to the flour mixture. If you don’t have one of those fancy smancy mixers, well grab anything that can mix the dough gently. To make the sauce simply mix together all of the sauce ingredients and adjust the seasonings to your taste. Set aside. 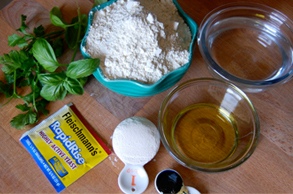 Sprinkle some flour onto your counter, take 1 ball of dough and dredge it in the flour on all sides. Using your hands (watch the video for proper instructions) or a rolling pin, roll the dough out to a 10 inch circle. Using a pizza peel (or a baking sheet upside down so that there are no edges) place the rolled out pizza dough on it and start topping it. To make a red pizza, using a ladle add the no cook sauce and using the back of the ladle swirl it all over the top of the dough. Top it with the shredded cheese and using the pizza peel slide it onto the pizza stone. At this point you can add peperoni, sausage, veggies, fruit whatever you like on a pizza and how much you like. Be creative! Cook for 20 minutes, rotating half way through to insure even cooking. To make the white pizza, roll out the dough exactly the same way and place it on the pizza peel to top it. Brush the garlic oil all over the top of the dough, place the spinach and broccoli evenly all over the dough. Using a teaspoon dollop the ricotta all over the top of the veggies. Sprinkle the veggies lightly with salt and top the whole thing with the shredded cheese. Bake for 20 minutes rotating once half way through. The pizza dough is very good and cooks up crispy. Most of all, it is fun to make. 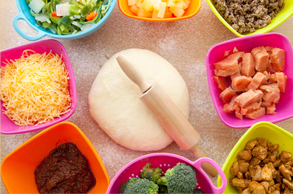 If you do not use all of your dough, you can roll it up in a ball, freeze it and use it later when you want to make a pizza. Please enjoy your time with your family and when you are here at Pensacola Beach, please visit ours at Papa’s Pizza.